The exciting new Unibridge is specifically designed to maintain - and improve - all the truss type bridge advantages over concrete, and eliminate the weak points. Truss type bridges have many advantages over concrete bridges particularly in areas that are difficult to access, but they are often regarded as temporary bridges due to their eventual "sagging", limited life span and rusting or looting of components. Unibridge has specifically addressed these weak points while retaining the advantages of the truss bridge concept. 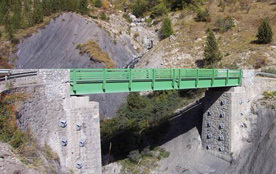 Unibridge is, arguably, the only modular steel bridge that can cover clear spans of up to 30m or more and still meet the rugged Australian AS 5100 standards (T44, SM1600 or HLP320). Unibridge modules are delivered in 40ft containers ready to assemble with no welding or machining required on site. The simple and elegant design enables a Unibridge to be installed in hours with telescopic mobile crane or any other medium capacity lifting equipment generally available or by launching using a specially designed launching nose. Unibridge can serve as a permanent structure or be moved to a new location by the owner. Unibridge steel bridges girders are pre-cambered and therefore will not sag as it is too often the case with truss type bridges. Unibridge has been designed according to the demanding European Standards Eurocode and have a design life of 100 years and 2 million cycles. Unibridge comes in single lane, two lanes or multilane design with or without lateral sidewalks. It is a modular concept and therefore Unibridge can be expanded in width to meet increased traffic. Unibridge is the answer to the modern bridging needs and has the options and flexibility today's clients require in their bridges.